Halp is an integrated help authoring and display tool for Microsoft Access applications. It consists of a set of Access objects that a developer can add into an application to provide both context sensitive help topic authoring and help topic display. Developers can press Ctrl-F1 to create help content for the form or control that has the focus, and end users can press F1 to view that content on a familiar looking help form. Halp can display help topics on a configurable help form using rich text formatting (Access 2007 and later file format), or as tooltips that appear at the cursor location on the screen. 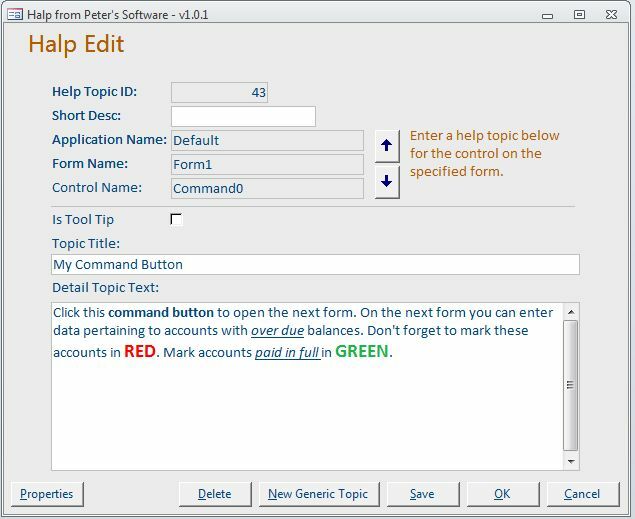 Help topics can be specific to the active control, or more general for the active form if no help topic exists for the active control. Generic help topics can be created and inserted into other topics at a specified location. Tooltips can appear similar to Access control tip text, or can include an icon, title and a ‘balloon’ style. Halp is easy for developers to implement into their application. After importing the Halp objects, the developer adds a simple ‘Autokeys’ macro, and then one line of code to each form that will have context sensitive help. The developer then presses Ctrl-F1 to begin entering help topics. Halp is even easier for end users – just hover the mouse over a control to see tooltip help content, or press F1!